Far ago and long away in a kingdom, whose name I don’t care to remember, was an emerging venture funded startup. We’ll call it StraightArrow. Its enterprise product for drawbridge management was a major improvement on what the feudal and knightly segments had traditionally used. The CEO, Lance A. Little, had tried everything from social media to ads painted on the sides of jousting horses to sponsored mead drinking bouts – all with indifferent success. StraightArrow was not hitting its growth targets and its investors were starting to dust off their management methods such as the rack and the dungeon. Over a lunch at the ale house, Lance and his marketing team pondered ways to get their message across the moat. Clearly, mass media such as peppering a potential customer castle with logo bearing arrows was ineffective. Theirs was a product appealing to a relatively small number of castles and princely buyers, so non-traditional tactics, even if individually more expensive, could still be affordable. Over the next round of mead, they considered placing a tempting object in front of the raised drawbridge. One which would be too tempting to ignore. Reaching your target audience is difficult – whatever the communication medium. It has defenses for weeding out unwanted communication including yours. Most of your messages will die unseen in SPAM filters, voicemail, mute buttons, fast forwards, and waste bins. Real, as opposed to virtual junk mail, may be seen. It is seldom opened, let alone attended to. A classic alternative is to send something sufficiently remarkable that it peaks the recipient’s curiosity. Something beyond the postcard or form letter, electronic or physical, which is hard to be immediately ignored. Something real and solid in three dimensions. Dimensional communications can be effective because they are novel. How many have you received this month? They are uncommon in part because they are far more expensive per message. The marginal costs of most media are trivial. The costs of a dimensional campaign are not. The higher cost makes targeting even more important. Many firms sling cheesy tchotchkes rather than send desirable tangible targeted premiums to real prospects. In other words, they abdicate marketing. 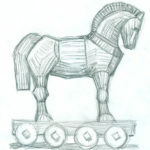 Perhaps the best known example of using an enticing package is the myth of the Trojan Horse. The Greeks, so the legend goes, had exhausted traditional marketing media during ten years of war. Then they went dimensional with a precisely targeted package. Their campaign succeeded. Now you need the Wayback Machine to visit Troy. Successful marketing campaigns have been built on dimensional marketing. They provide a compelling narrative by delivering a series of intriguing components to get the attention and engagement of an audience. For example, to reach technology decision makers, one might send in successive shipments, the components of a robot. When the final component arrived and the robot completed, it might invite the recipient to a presentation or event. This requires a lot of thought to do well. Then there is the brute force approach. I recently received an unexpected package about 10” by 4” by 14”. The label indicated it was from a supplier of office products. Though I have bought from them, I had no outstanding orders. The box was suspiciously light. In fact, it contained nothing but some sealed-air packaging and a single page print ad. The ad offered a trial on a package of “healthy snacks.” The same ad could, of course, have been sent by many other media. None of these could have been as anticlimactic or disappointing. The predictable result – no sale at a much higher cost. To cross the moat, you need more than hip boots. This entry was posted in Media and tagged communication, marketing, Tactics on August 31, 2016 by Peter Buechler.